Popping up all over the place in lieu of the plain salted soybean, this new brand of Edamame really hits the sweet & savory high notes. I know I'm obsessed. Of course I had to try making this for myself, especially when my mom brought home a fresh bag of em from Marukai. First, we need to have a little conversation about the work Teriyaki. In it's correct pronunciation, the Japanese roll their r's slightly. Teh-ree-yah-kee. The word teriyaki derives from the noun teri, which refers to a shine or luster given by the sugar content in the tare, and yaki, which refers to the cooking method of grilling or broiling. So the correct response to me asking, would you like some Teh-ree-yah-kee Edamame? "Um. Can you please speak American?" 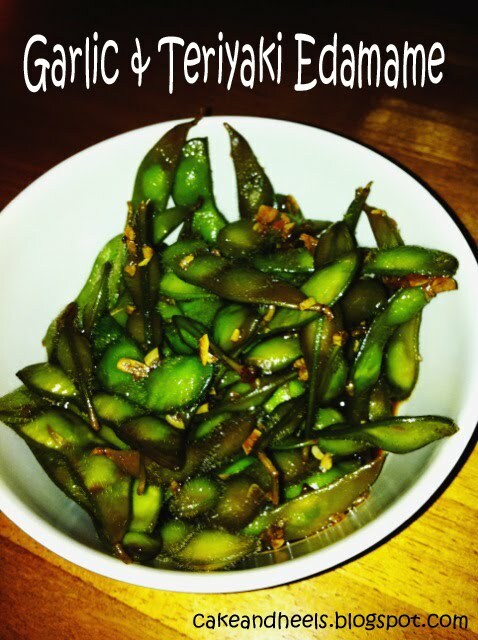 Steam the Edamame & set aside. In a small saucepan over low heat, combine the soy sauce, sugar & garlic until combined. Reduce until it's a medium thickness. Add in the lemon juice & sesame oil. Take off the heat and pour over the Edamame. Mix & top with a sprinkle of sesame seeds for garnish!